Our work with the Contra Costa Transportation Authority represents a 23-year relationship with the Authority, and an evolving approach to transportation policy in the county. Dyett & Bhatia worked on the original Countywide Transportation Plan (CTP) and its update, and is engaged in ongoing planning, growth management, and congestion management services for the Authority. 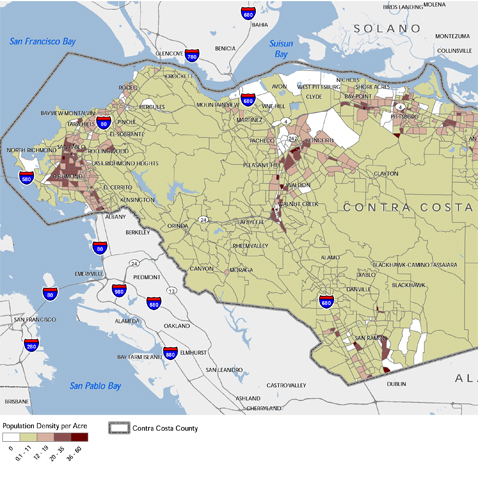 The 2014 Plan Update is examining current countywide trends, including population and job growth, demographic shifts, highway congestion, transportation mode choice, and commute patterns and preparing the foundation for a ballot measure on a new Transportation Expenditure Plan, to be funded by a voter-approved extension of a sales tax. In addition, in cooperation with Environmental Science Associates and DKS Associates, Inc., Dyett & Bhatia has completed EIRs for several CTP updates and assisted the Authority in its work on the Congestion Management Program (CMP).